The Victorian Government should cease subsidising VicForests, its loss-making logging business . Most of the logged forest logged ends up as low value woodchips, the market for which has just collapsed with the Japanese-owned South East Fibre Exports woodchip mill no longer accepting Victorian woodchips (The Age, 29/5/14). However, VicForests continues to log our remaining wonderful native forests, including Toolangi State Forest that wasn't burnt during the Black Saturday bushfires. Professor David Lindenmeyer has repeatedly warned that Leadbeaters possum, Victoria's faunal emblem, is destined for extinction if VicForests continues to log our Central Highlands forests. Instead, the Victorian Government should support the community-led proposal to create the Great Forest National Park to protect our scarce remaining native forests, rather than continue to destroy them. It makes much more sense to create long-terms jobs in managing and protecting our forests and associated tourism. These forests harbour the tallest flowering trees in the world. In addition, the forests provide valuable water. There is more than enough plantation timber resource available than can immediately provide a substitute timber resource. We are just lacking the political will and courage to stop the logging and create the urgently needed new national park that will benefit all Victorians. 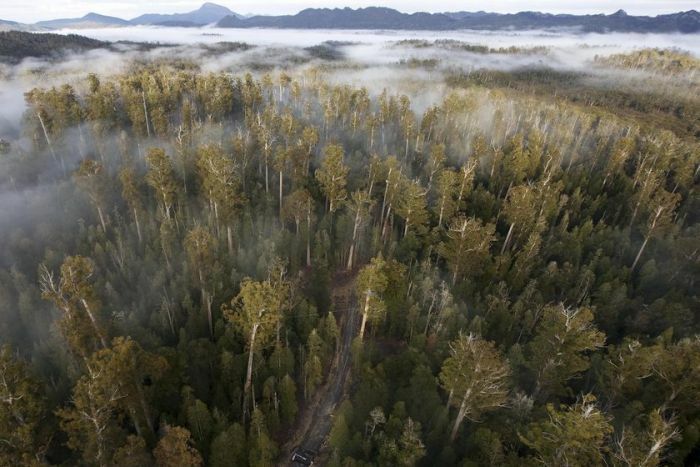 The Federal Government is ignoring a Senate inquiry's advice on a World Heritage-listed forest in Tasmania after the inquiry condemned plans to delist the forest. The extension of Tasmania's World Heritage area is the centrepiece of the so-called forest peace deal. But the Coalition opposes the deal and say they want the World Heritage committee to reduce the Tasmanian extension by 74,000 hectares. Greens leader Christine Milne is on the Senate Committee that has told the Government to stop trying to delist the forest. "If a country like Australia decides that, as a result of a political whim, it can destroy its World Heritage area to facilitate logging, that will send a very clear message to other countries that they can adjust their boundaries for uranium mines or any other kind of mining, logging, tourism, development or whatever they like," she said. "It would be a real blow to World Heritage globally." Tasmanian Liberal Senator Richard Colbeck says the Government will push on with its request. The area contains some plantations and areas that have been previously logged. Senator Colbeck says it should never have been World Heritage. "I think the Tasmanian community said at the federal election last September, and again at the state election in March, that they want to have a forest industry, they want to sensibly use our resources in Tasmania, but they also ... value and want to maintain the wilderness World Heritage values of the outstanding area that is the original estate," he said. "So I think there's an opportunity to have win-win-win all round." The World Heritage committee will hand down its draft decision this week. Spokesman for the Tasmanian Special Timbers Alliance Andrew Denman is hoping the area's World Heritage status will be revoked. Mr Denman builds boats out of specialty wood and he says the forest agreement and subsequent World Heritage listing is putting pressure on timber supplies. "The TFA (Tasmanian Forest Agreement) has had a terrible impact on especially the timber sector," he said. "We've seen a massive reduction in supply of timber, in some cases over 90 per cent for some species. "We've also seen a doubling and sometimes a tripling of the resource price as well, all because of a political agreement to restrict access to a sustainable resource. "So if the World Heritage committee decides not to approve the Federal Government's request to remove 74,000 hectares, obviously that 15,600 hectares of specialty timber area that could possibly be accessed will not be available and that will have an impact on industry." Vica Bayley from the Wilderness Society is one of the environmentalists who negotiated the forest agreement and he wants to keep the World Heritage extension intact. "The industry has restructured and, similarly, the specialty timber sector needs to readjust and accept that fact," he said. "There are plenty of specialty timber operators and specialty timber workers that are saying, keep this World Heritage list, keep the Tasmanian Forest Agreement, and let's work with what we have." Environmentalists have already been back into the forests protesting against the World Heritage delisting. Mr Bayley says delisting of the World Heritage forest will spark more protests. "If these World Heritage listed forests are indeed delisted and they are indeed logged, clearly people will continue to stand up for their protection," he said. "Not only here in Tasmania, but across Australia and around the world. And, that's not only people that care about the forests; that's people that care about markets and where they get their wood from." Environmentalists will travel to Doha next month to lobby the World Heritage committee when it makes its final decision on Tasmania's forests. The owner of the Eden woodchip mill has announced it will not be renewing its contract to purchase timber from state forests in East Gippsland, when the current agreement expires at the end of 2014. South East Fibre Exports general manager Peter Mitchell says international market pressures are the major reason behind the decision, and that company shareholders are yet to give SEFE any final direction on its next move. Mr Mitchell said that while the announcement is a “serious development”, it does not signal an imminent closure for the chip mill. “International market pressures have made it difficult for us to compete by selling VicForests’ resource on the basis of price and quality,” Mr Mitchell said. “Obviously Vietnam is exporting a lot of wood chips now and has taken over from Australia as the world’s largest exporter. “But I can reassure people that as far as Eden goes, we won’t be closing tomorrow. In the wake of the announcement, Chipstop campaigner Harriet Swift has challenged SEFE and parent company Nippon Paper to “come clean about their future plans”. She said the Eden woodchip mill “should close now” and cease logging operations for the good of forests and wildlife. “Closing the chipmill now would avoid so much suffering, save valuable carbon sinks and allow the forests and the community to start the healing process after 40 years of woodchipping,” Ms Swift said. The Australian Forests and Climate Alliance (AFCA) also welcomed SEFE’s announcement, labelling it a “body blow” to the logging industry. AFCA spokesperson Jill Redwood says it is time to follow the lead of whaling and “retire the industry to history”, and warned the logging industry against turning its focus to biomass burning. “This is a key turning point in the history of south-east Australia’s forests,” Ms Redwood said. “Forests as now seen as essential climate moderators and Governments should take this opportunity to re-value them as carbon stores, water production areas and as essential habitat for so much of our rare wildlife. But VicForests CEO Robert Green says there are no plans to cease logging operations, saying SEFE’s announcement has ended ongoing uncertainty and now allows the state-owned business to move towards identifying new opportunities. Mr Green said there is still strong demand for timber produced in East Gippsland, and he is confident that the industry will continue in the region, with or without export woodchips. “SEFE’s decision to cease taking timber from Victoria will affect the market for residual timber produced from our harvesting operations,” he said. “SEFE has been an important part of the Victorian timber industry for decades and we understand this is a commercial decision which has been made due to a range of external factors. “Importantly, there will continue to be a timber industry in East Gippsland, and the region will continue to benefit from the contribution made by the industry. But Victorian Greens leader Greg Barber disagrees, saying SEFE’s exit from East Gippsland is “the beginning of the end” for native forest logging. Mr Barber says VicForests are “in denial”, and urged the Government to immediately put a plan in place to end native forest logging. "VicForests is a loss-making public owned company and now it is absolutely finished,” Mr Barber said. “They can't sugarcoat it; no one wants to buy their product and they can't make any money off it. “Their media release shows they are in complete denial about it. "The native forest loggers have been comprehensively beaten in the marketplace by plantation tree growers. “Instead of throwing more taxpayer subsidies at it, the government should accept the inevitable and come up with a plan for an orderly, fair and rapid exit from native forest logging. “It's what the vast majority of the public wants." The future of native forests logging in East Gippsland is under a cloud after the main woodchip customer in the region announced it would not renew its contract with Victoria's state-owned timber company. South East Fibre Exports, which owns a large woodchip mill at Eden in south-east NSW, has told VicForests it will not accept East Gippsland residual timber - the waste from native forest logging not turned into sawlogs - after this year. VicForests chief executive Robert Green said the company faced a challenge to run a forestry industry in the state's east that continued to support jobs if it no longer exported woodchips. The decision puts further pressure on VicForests which is seen by some as having underperformed financially since its inception in 2003. Last year VicForests registered an $802,000 profit; the year before it registered a $96,000 loss. The lacklustre performance has prompted questions about whether the loss of native forests through logging is justified for little profit. VicForests spokesman David Walsh said it supplied about 200,000 cubic metres of wood to the Eden mill in 2012-13 - about a sixth of the total 1.2 million cubic metres of wood produced by VicForests for the year. But Mr Green said there would continue to be a native logging industry in East Gippsland - one of the two major logging areas in the state. "The announcement offers the certainty necessary for us to get on with the job of looking to the future and identifying new opportunities for the industry," he said. The loss of the contract could also put pressure of the region's sawlog industry, given the sale of waste timber for woodchips contributes to making the industry viable. Mr Green said VicForests would continue to meet its commitments to sell higher-value sawlogs. Victorian Greens leader Greg Barber said: "Japanese woodchip companies [that own the Eden mill] have more environmental consciousness than the Liberal Party. Plantation wood is greener, makes better paper and there's millions of tonnes of it available. "VicForests is a loss-making public-owned company and now it is absolutely finished. They can't sugarcoat it. No one wants to buy their product and they can't make any money off it." The decision to end the VicForests contract at Eden had been expected for some time among forestry circles given the struggling financial performance of South East Fibre Exports in recent years. Agriculture Minister Peter Walsh said the government, along with industry and parts of the East Gippsland community, had last year begun drawing up a plan to explore other markets for logs used for woodchips. "The Victorian Coalition government recognises that forestry makes a valuable contribution to regional jobs and small communities and we will continue working with local communities to support viable, sustainable and responsibly managed local industries," he said. Speaking on ABC Radio in Gippsland, South East Fibre Exports general manager Peter Mitchell said the decision was a result of lower international demand, increased production in countries such as Vietnam, and more wood flowing from failed managed investment scheme plantations. THE future of Victoria’s taxpayer-owned logging company is in serious doubt after one of its biggest customers announced it would no longer buy timber from the state’s forests in East Gippsland. South East Fibre Exports, a wholly owned subsidiary of Japanese paper giant Nippon Paper, said it would not enter a new agreement with VicForests when its present contract expired. The contract was believed to be worth about $12 million annually with SEFE taking about half of its supply from VicForests. Industry sources say the ­decision could spell an end for native forest clearing in East Gippsland and put further pressure on the state-owned logging company, which has continued to receive government subsidies despite failing to pay a dividend for more than five years. Farmers continue to put pressure on the State Government to stop logging in the Yarra Valley catchments due to reduced water supplies. VicForests’ chief Robert Green said despite SEFE’s decision affecting the market for residual timber produced from harvesting operations, the industry in East Gippsland would continue. “The challenge in front of us now is to build a different ­future for the timber industry in East Gippsland, which continues to provide jobs and economic benefits to the region but may not include export woodchips,” he said. Victorian Greens leader Greg Barber said the State Government should stop logging native forests instead of subsidising it. “VicForests is a loss-making public-owned company and now it is absolutely finished,” Mr Barber said. Environment East Gippsland co-ordinator Jill Redwood said woodchipping had been an economic drain. “The Government should now manage our public forests for public good not for private profit,” Ms Redwood said.